The Philips Hue Calla bollard-style light fixture, $130, costs a small fortune compared to the typical compared to the typical “dumb” low-voltage outdoor LED path lighting. In fact, you can buy a half dozen of the latter—as you might need to fully illuminate an entire pathway—for the price of one of the former. But the Calla offers three major advantages conventional lights don’t: You can select from 16 million shades of colored light, various temperatures of white light (warm to cool), and you can integrate it with other Philips Hue bulbs and luminaires, indoors and out. If you don’t already have Hue lights, you will need to purchase a Philips Hue Bridge, ($50 at Amazon) to control the Calla. But Philips was wise not to drive the cost of this product even higher by including the ZigBee-to-Wi-Fi bridge in the box—most people investing in this light will already have the bridge, which can support up to 50 Philips Hue lights. The Calla is a single 9.9-inch high, 4.1-inch diameter, black aluminum cylinder with a non-replaceable 8-watt LED bulb on top (the bulb is rated to last 25 thousand hours). Six hundred lumens of light (equivalent to a 49-watt incandescent bulb) shine through a frosted white lens. The fixture can rest on any flat surface or you can mount it to the provided stake, drill a hole in the ground, and stick it in there. An IP65 weatherization rating means the Calla is dust tight and protected from water jets (from a nozzle up to 6.3mm in size) hitting it from any direction. It’s well protected from rain, sprinkler systems, and getting hosed down when you clean your sidewalk, but I wouldn’t tempt fate by hitting it with a pressure washer. Philips provides a sealed, in-line, low-voltage power supply with the Calla. You’ll need to plug the power supply into an outdoor outlet that’s protected by a bubble cover (it’s best that this outlet not be controlled by a switch, since shutting off power to the light defeats the purpose of deploying a smart light). The fixture itself has a stub cable with a bayonet-style connection at the end. This connects either to the longer cable emerging from the power supply or the provided 16-foot extension cable. Once you’ve set up one Calla light, you can buy up to four additional units and daisy-chain them to the same power supply. 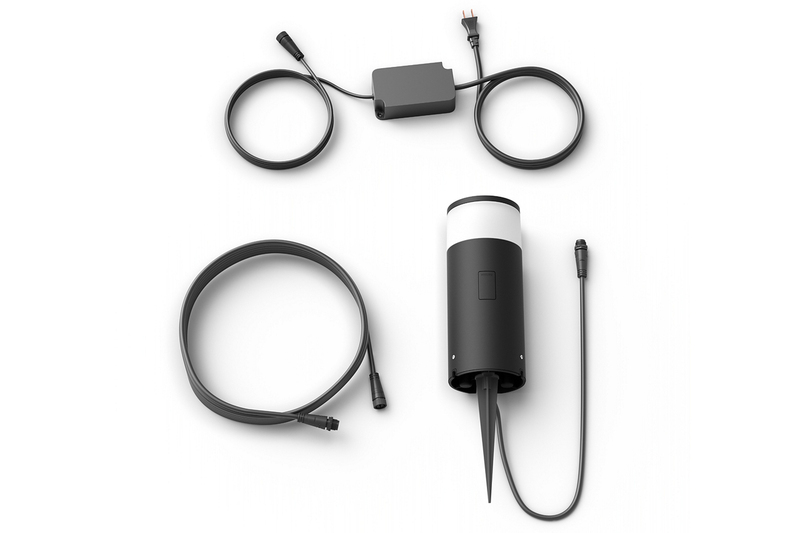 These extension kits, which come with cables and T-style electrical junctions but no power supply, cost $90 each (if purchased directly from Philips Lighting). In addition to creating indoor and outdoor lighting scenes—based on brightness, color, and lighting temperature—the Hue app allows you to create routines during which the Calla will turn on and off, change colors, and so on. 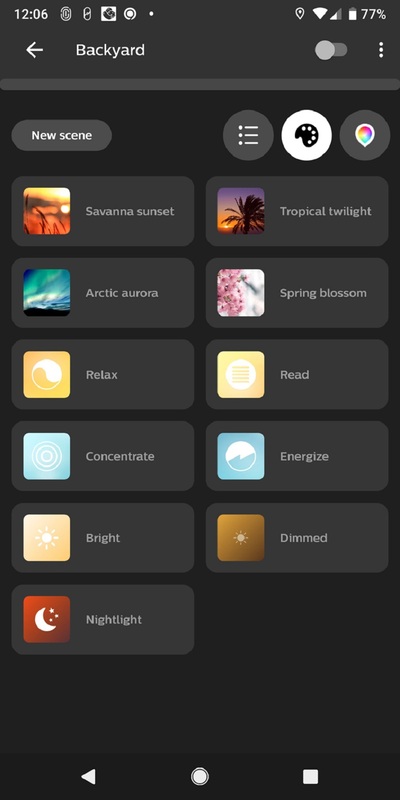 A “go to sleep” routine, for example, will set the light to a defined color temperature at a specified time, and then gradually fade to off over a define time (e.g., over a 30-minute period). You can also integrate Hue into other apps and control Hue bulbs and fixtures using voice commands if you have a smart speaker such as an Amazon Echo, Google Home, or Apple HomePod (the Hue system is HomeKit compatible). I created a routine that turns the Calla on at sunset and off at sunrise. Hue started life as indoor lighting, so placing Hue lights outdoors might present a challenge when it comes to making a connection to your bridge. Fortunately, the ZigBee protocol Philips chose is a mesh network, so every Hue light you deploy extends the range of your network. Most of my smart-home’s lighting is based on Z-Wave technology, so I had some control issues in the beginning—the Calla was too far from the bridge, and I didn’t have any Hue lights in between it and the router where the bridge is connected in my home-run. Installing a set of Philips’ Lily outdoor spotlights ($280 if purchased direct from Philips Lighting ) in the shade garden outside my home office fixed that problem instantly (I’ll have a review of the Lily soon). If you have trouble connecting to outdoor Hue fixtures, and it’s not feasible to move the bridge, consider deploying one or two Hue bulbs inside the house in between the bridge and the outdoor device. Does it justify its price tag? The Calla is an expensive outdoor fixture, especially if you need to deploy it in multiples to illuminate a long pathway. It’s not exceedingly bright, but when installed next to a walkway; it produces pool of light that’s large enough to illuminate your way. So it’s better at adding a pleasant bit of atmosphere to your outdoor areas than anything else. Bottom line: This is a well-built luminaire that’s designed to stand up to the elements, and it ties into what is arguably the best home lighting ecosystem on the market today. The Philips Hue Calla outdoor pathway light adds sophisticated safety to outdoor walkways and patios.